Injured or not? Sure looks distressed. Recently during a horseback ride as the steed and I were crossing a gravel parking area to more interesting places, we found ourselves confronted by an injured bird. Nearly under my mount’s nose, the bird flopped, hobbled a few steps away and thrashed some more on the ground. What to do? Should I try to catch it and take it to a vet? 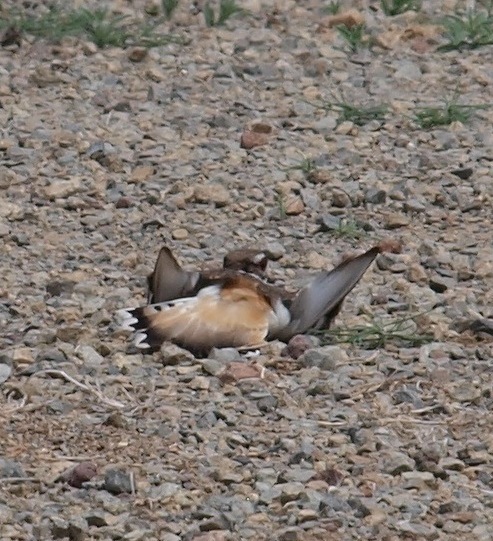 In reality, this was a Killdeer (Charadrius vociferus) renowned for pretending injury to draw attention away from other things. By standing very still and watching where the bird was moving FROM, I spotted the nest with it’s four perfect eggs. Killdeer eggs are very pointed to keep them from rolling. Since the nest was in a potentially vulnerable spot, I returned the next day with some markers to alert drivers, horseback riders or the mowing crew to the location. Even knowing the approximate spot, the nest was difficult to relocate. Once again, the mama bird went through her dramatic repertoire. I put out my markers and waited. The mama bird suspiciously examined the bricks but eventually returned to her nest. Even with the visual help, can you spot the nest? How easily can you spot the nest? 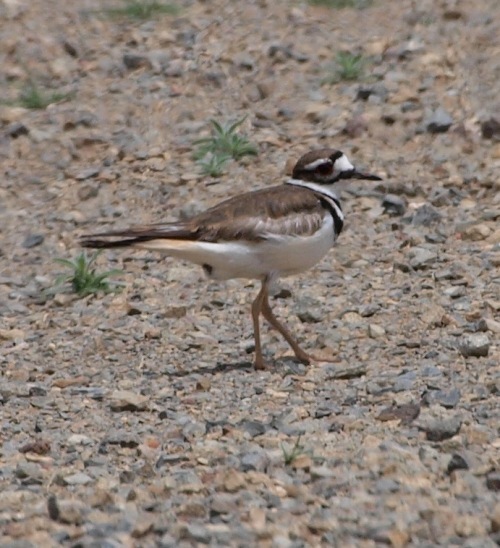 Killdeer, once known as “chattering plovers” for their noisy tendencies, are an inland shorebird common throughout the United States. They typically favor open gravelly areas for nesting and begin by scraping a series of shallow depressions. 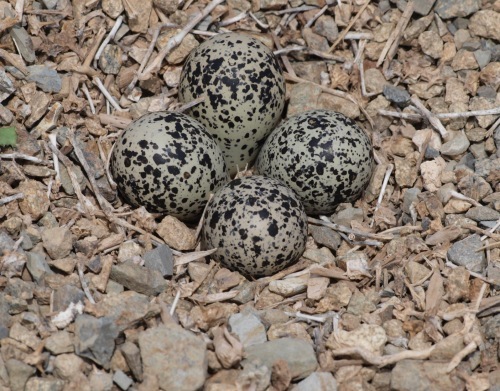 After the female chooses one “nest” and lays eggs, the shallow hole is enhanced by the addition of pebbles and sticks often of lighter color, an intentional choice proven through experiments. Chicks are “precocious” like chickens or ducks and have a full coat of downy fluff upon hatching. They leave the exposed nesting site following their mother as soon as they are hatched to begin foraging. 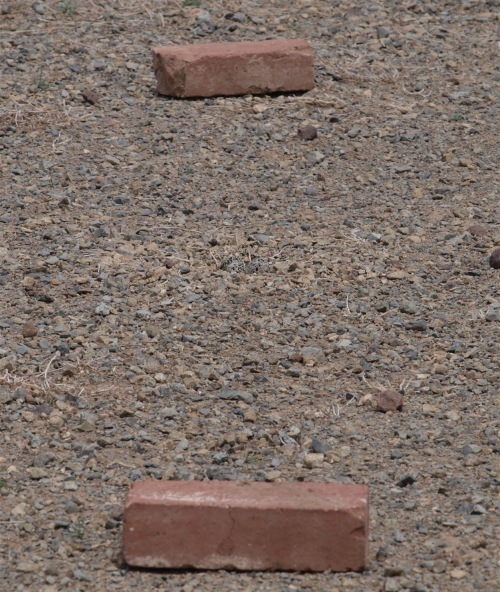 This entry was posted in Critters, Flowers&Fauna and tagged Birds, killdeer, killdeer eggs, nature, New Mexico, outdoors, wildlife. Bookmark the permalink.